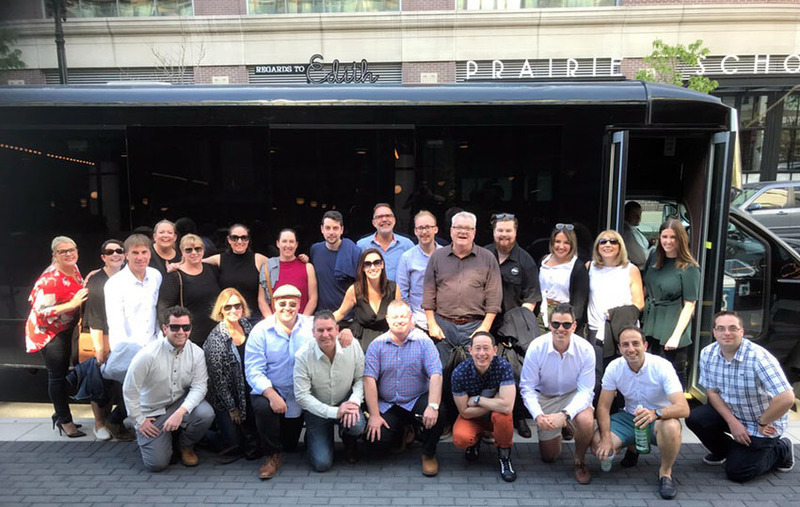 The Progressive Hospitality Network of the AHA Victoria reports big success from its inaugural study tour to Chicago, meeting and experiencing some of the latest and greatest of the USA. The five-day trip by the Progressive Hospitality Network (PHN) this month centred around the 99th year of the massive National Restaurant Association Show that took place 19-22 May at McCormick Place, the largest convention centre in North America. They spent two days exploring the four interconnected buildings, showcasing everything hospitality, from tablecloths to defibrillators. Attendees from the Zagame Group (Jackie Booth and Chris Bonello) were asked to judge this year’s Bellavita Awards, in the Italian Pavilion, casting a vote on 22 products, including prosciutto, Parmigiano-Reggiano, fresh pasta, olive oil and truffle. The PHN group saw innovation in facial recognition and food-delivering robots, and displays on the top mixologists, ingredients and products in the Alcohol Pavilion. Despite the American slant, the Aussie hospitality guests report a lot of relevance in the Show’s learning sessions: Adopting Cocktail Trends in Small or Multiunit Operations, Craft Beer Panel, Craft Your Cocktails, Equality in the Workplace, Increase Sales through Culture, The Art of Hospitality, and Understanding the Wine Drinker of 2018. Furthering the trip, PHN attendees were granted time with localised outstanding examples of the craft. Hogsalt Hospitality provided a tour of the group’s 3 Greens market, a mini food hall concept bringing a selection of the group’s businesses together, serving a huge range of choices, Maude’s Liquor Bar, serving rustic French cuisine and a curated wine list, and Au Cheval, a dimly-lit diner-style bar where you may queue for up to four hours to get one of their famous cheeseburgers. Also Publican Quality Meats, which by day is a butcher shop, café, bakery and gourmet market, and by night a private dining room. Operator One Off Hospitality counts 11 venues, often located on all four corners of a block, allowing for the sharing of resources, staff and supplies. The group also experienced some of the essentials of Chicago, including view of the Cleveland Indians beating the Chicago Cubs at Wrigley Field – from the custom rooftop seating of a neighbouring residence, as well as the chill of a Spring breeze off the great lakes, with bright sunny days on temperatures below nine degrees centigrade. The trip was made possible by marquee sponsors Keno, H&L Australia and CUB. “This truly was a unique opportunity for the next generation of publicans and the emerging leaders within our industry to network with Chicago based hospitality disruptors offering new and innovative ideas to inform their venues,” says AHA (Vic) senior manager Kimberley Malcolm. The full article on the Chicago trip will appear in this month’s magazine from the AHA Victoria.